Beach Villa. Nokomis Beach just 1/2 Mile Away. 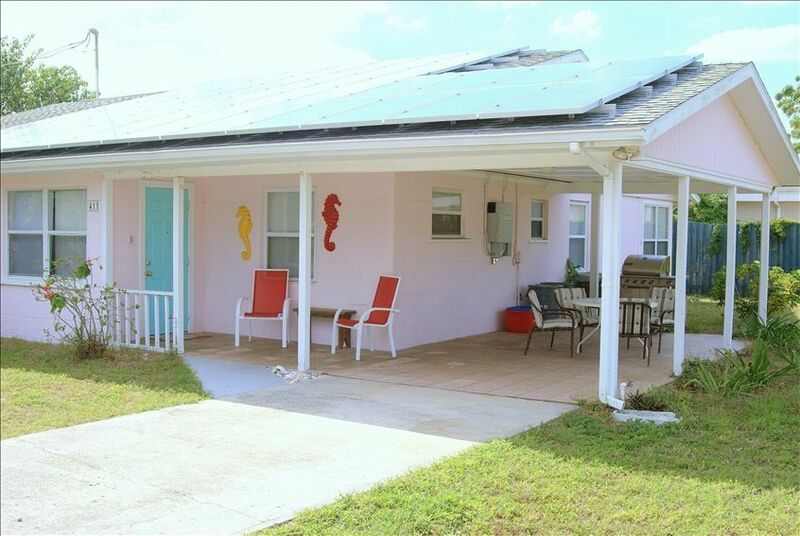 Seahorse Shores - 411 Shore Road - Two Bedroom Beach Villa Located 1/2 Mile From Nokomis Beach and Casey Key. Fabulous location in a beach neighborhood just a 10 minute walk by sidewalk from your front door to the beach. Tiled carport with gas grill, table and chairs serves as a covered patio. Private parking in your own driveway. Small porch with chairs at front door. Free use of bicycles and beach equipment. Ice cream parlor 1/4 mile away. Luxurious high flow Speakman shower head with LOTS of water pressure & hot water. Clean Sarasota County Water (not well water). We have been proudly serving guests since 2003 and our guests return again and again to enjoy our clean, quiet, safe and comfortable accommodations in a great location. Put our address into Google Maps or Mapquest to see our exact location: 411 Shore Road, Nokomis, FL 34275. Please scroll down to see all our photos and information. Our clean, charming and cozy villa, located in our Seahorse Shores duplex, is thoughtfully outfitted for your maximum vacation enjoyment. Your home away from home is tastefully appointed, approximately 800 square feet, non-smoking, and has two bedrooms, one bath, living/dining area, kitchen and a spacious, sunny Florida room. Fully-equipped with all amenities: dishwasher, smooth top range, coffee maker, toaster, microwave, patio chairs, etc. Pets are allowed with prior permission. We are fully licensed and inspected, as required by law (unlike most of our competitors), by the Florida Department of Business and Professional Regulation, Division of Hotels & Restaurants. Our license number is CND6804721 and you can view our license information on the Florida state website via the 'links to more information' below the rates at the bottom of this page. We provide a great guest binder in the villa with information about activities and with menus from the great local restaurants. -- Great Fishing and Golfing is plentiful and well known to those who enjoy those sports. The Venice Jetty Fish Camp (1.5 miles away) sells live bait shrimp before dawn to those wishing to fish early. -- Eat Grouper sandwiches and other great local seafood at Pelican Alley, Pop's Sunset Grill, Marker 4, Captain Eddie's and Briandi's, all less than 3 miles from your front door. In the unit - not shared. Nicely stocked with nice pots, pans, utensils, etc. Tiled carport with chairs and grill. Let me preface this that if you are looking for immaculate place for significantly more money then move on as you will see a spot here and there. Otherwise look no further, it's a very decent place at good location and terrific value. We had 2 kids and 2 dogs and the place was just right for our family. House is very well supplied, even linens and towels, we did not know it and brought our own. Aldie and Publix a quick drive a few blocks away. Nokomis public beach is a short drive or even walk away. We drove when we had a lot of beach chairs/accessories to carry or walked to the beach when not much to carry. Overall we were very pleased with it and would like to return here again. While this unit is old, I found it to be very clean upon my arrival. Yes, it is not fancy and probably furnished from the thrift shop but it was adequately stocked with dishes, pot and pans, etc. I absolutely loved the location- a 10 minute walk to beautiful Nokomis Beach, the drum circle, ukulele jam and the best restaurant in town, Pelican Alley. It might be cramped feeling for more than 2 people as the rooms are small. I especially appreciated the fact that pets were welcomed and I enjoyed staying there with my dogs. If you want champagne at beer prices, Seahorse Shore is probably not for you. As for myself, I found it to be “shabby chic” and a lot of fun. Air conditioning worked great, washer and dryer adequate, WiFi very slow, Verizon cell service not good in this area (not the owners fault). There is parking for 2 smaller cars, no street parking . It’s a great neighborhood to walk your dogs, close to Publix grocery store, a 15’ drive to Brohard Paw Park and dog friendly beach. 3 stars for quality ( think Red Roof Inn), 5 stars for location. Thank you! (WiFi issue is now fixed). Good location, but on arrival we were greeted with rugs hanging on railing and a trash bag and laundry basket at front door. Upon entering we were assaulted by an overwhelming odor of old grease and dead fish. There were dust bunnies in corners and overall it wasn't clean, just sort of wiped down. I spent my first hour there just cleaning counters, etc., while my husband went to get air freshener. The first night I felt as if something in bed kept biting my ankles and feet. The next day I rewashed linens in hot water which seemed to alleviate that issue. I also had to wash all of the towels and wash cloths as they had absorbed the odor that permeated the unit. The yard was overgrown and flower beds weedy. It's a shame because it could be a decent vacation rental. We won't be returning. Due to issues with our cleaning company we have changed cleaning companies since your feedback. Thank you. I have zero positive things to say about this property, the owner or this experience. The property is not as depicted. When I arrived I noticed the dirty exterior. Inside was similar. I can overlook a lot but do not feel a clean mattress and couch to relax and feel comfortable on during vacation is too much to ask for. They appeared dirty and looked very old. I noticed other things such as rust on the refrigerator and rust coming from the oven vents. I then checked the bed and found hair under the sheets. I left immediately and called VRBO who directed me to call owner. His demeanor was very rude and argumentative. We choose not want to argue with him. There was no additional cleaning that could be done as this unit needs new or newer mattresses and couch put in, in addition to a top to bottom deep cleaning. In my opinion what appeared as vintage charm in the photos on-line (which I can only presume were taken many years ago) is now old, rusty and dirty. We opted not to stay after viewing the true condition of the property. When I asked for a formal refund from the owner I was met with a combative and less than kind attitude. In the end I rented another unit and lost all the money paid, this experience has been a nightmare. I have used vacation home rental sites 5 times in the past 2 years and have had no issues or concerns until this property. This is an extremely unfair review. I received a call from VRBO that there was a problem and immediately went to the property which is only a mile from my house. While enroute I received a call from the guests who said they were not there and they wanted a refund because the property would not work for them. They refused to provide any details in that call and in several days of emails after and basically just threatened this type of review. The property is exactly as depicted in the photos and the photos are very recent. The couch they are referring to is spotless. Recently reupholstered in Naugahyde and totally clean. As they said: "There was no additional cleaning that could be done". Because it was spotlessly clean as witnessed by me, the cleaning staff, and other guests who had viewed the unit. Not to mention the guests immediately before and after the guests who had the problem. And the mattresses are relatively new and are found to be very comfortable in other reviews from other guests. So they try to claim that some spots of rust on the side of the refrigerator and the "oven vents" (range hood) and dirt on the exterior of the house entitle them to an on the spot full refund. We do take guest satisfaction very seriously and realize that even the smallest detail can detract from some people's enjoyment. Consequently, we have sanded and painted the range hood and the side of the refrigerator that had a few rust spots, as well as pressure washed the exterior of the house. But the idea that these minor imperfections justified this type of behavior from the guests is just not true. Had these folks really wanted to work it out they would have wiated 5 minutes to meet with me at the property to see exactly what their true concerns were. Basically the wife decided the place wasn't luxurious enough for them and made the husband leave. After arriving in Florida a week before our scheduled stay, my wife was experiencing respiratory issues most likely due to the "Red Tide." I called the owner and explained the situation and requested a refund. Rather than trying to come to a amicable resolution, he instead began huffing on the phone stating he doesn't have control over the weather, it isn't his fault and that we were "Out of luck because we needed to cancel 60 days in advance!" All the while with his voice and attitude continuing to escalate. Funny thing was that we booked this home just 2 weeks prior to our stay, so in essence, we could not cancel regardless. As a result, we did not stay at the home so we can not rate the stay. As for the owner, I rate him a "1" on a scale of 1-10. If you're reading this Mr. Greg, you need to clean up your attitude and be a little more understanding to the needs of your guests. Money isn't everything and I can assure you, I wouldn't recommend your home. At Nokomis Beach, Drum Circle on Wednesday and Saturday Evening.